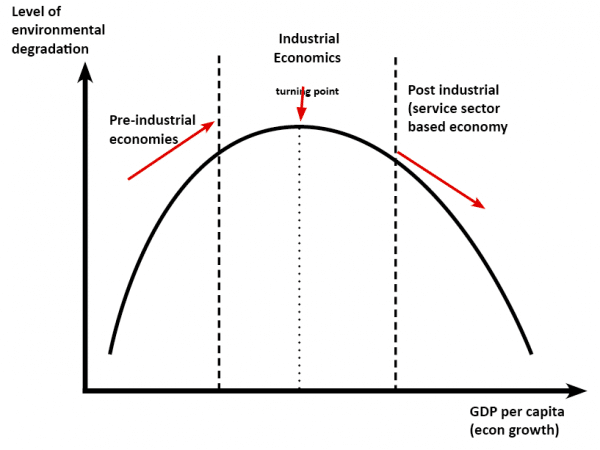 The environmental Kuznets curve suggests that economic development initially leads to a deterioration in the environment, but after a certain level of economic growth, a society begins to improve its relationship with the environment and levels of environmental degradation reduces. From a very simplistic viewpoint, it can suggest that economic growth is good for the environment. However, critics argue there is no guarantee that economic growth will lead to an improved environment – in fact, the opposite is often the case. At the least, it requires a very targeted policy and attitudes to make sure that economic growth is compatible with an improving environment. Spare income with growth. With higher rates of economic growth, people have more discretionary income after paying for basic necessities; therefore, they are more amenable to paying higher prices in return for better environmental standards. Focus on living standards as opposed to real GDP. Traditional economic theory concentrates on increasing real GDP and rates of economic growth. But there is a growing awareness the link between economic growth and living standards can be weak. Focusing on living standards can become politically popular. Improved technology. The primary driving force behind long-term economic growth is improved technology and higher productivity. With higher productivity, we can see higher output, with less raw materials used. For example, since the 1950s, the technology of car use has significantly improved fuel efficiency. In the 1950s, many cars had very low miles per gallon. In recent years, car manufacturers have made strides in reducing fuel consumption and have started to develop hybrid technology. De-industrialisation. Initially, economic development leads to shifting from farming to manufacturing. This leads to greater environmental degradation. However, increased productivity and rising real incomes see a third shift from industrial to the service sector. An economy like the UK has seen industrialisation shrink as a share of the economy. The service sector usually has a lower environmental impact than manufacturing. Role of government regulation. Economic growth and development usually see a growth in the size of government as a share of GDP. The government are able to implement taxes and regulations in an attempt to solve environmental externalities which harm health and living standards. Diminishing marginal utility of income. Rising income has a diminishing marginal utility. The benefit from your first £10,000 annual income is very high. But, if income rises from £90,000- £100,000 the gain is very limited in comparison. Having a very high salary is of little consolation if you live with environmental degradation (e.g. congestion, pollution and ill health). Therefore a rational person who is seeing rising incomes will begin to place greater stress on improving other aspects of living standards. Empirical evidence is mixed. There is no guarantee that economic growth will see a decline in pollutants. Pollution is not simply a function of income, but many factors. For example, the effectiveness of government regulation, the development of the economy, population levels. Global pollution. Many developed economies have seen a reduction in industry and growth in service sector, but they are still importing goods from developing countries. In that sense, they are exporting environmental degradation. Pollution may reduce in the UK, US, but countries who export to these countries are seeing higher levels of environmental degradation. One example is with regard to deforestation. Higher income countries tend to stop the process of deforestation, but at the same time, they still import meat and furniture from countries who are creating farmland out of forests. N-Shaped. Some economists argue that there is a degree of reduced environmental degradation post-industrialisation. But, if the economy continues to expand, then inevitably some resources will continue to be used in greater measure. There is no guarantee that long-term levels of environmental degradation will continue to fall. Countries with the highest GDP have highest levels of CO2 emission. For example, US has CO2 emissions of 17.564 tonnes per capita. Ethiopia has by comparison 0.075 tonnes per capita. China’s CO2 emissions have increased from 1,500 million tonnes in 1981 to 8,000 million tonnes in 2009. The link between levels of income and environmental degradation is quite weak. It is possible economic growth will be compatible with an improved environment, but it requires a very deliberate set of policies and willingness to produce energy and goods in most environmentally friendly way. Does economic growth bring increased living standards? This entry was posted in environment and tagged pollution. Bookmark the permalink. WHEN THE ENVIRONMENTAL KUZNETS CURVE DOESN’T WORK..?? Useful article thanks. If you Google “China moves to reduce pollution” or similar, you will get a lot of hits over the past few years.